In the debate between Ken Ham and Bill Nye the Evolutionary Dogma Guy, Nye decided it would be a good idea to ridicule Noah's ark and the Genesis Flood. In his prepackaged-sounding objections to creation science and the Flood, he engaged in numerous logical fallacies. One was asserting uninformed opinions that would have a negative influence on listeners (prejudicial conjecture). One of these was that some shipbuilders designed a ship that sank, therefore, Noah's ark could not have worked. Like so many others of his nature, he did not do his homework, embarrassing himself and other evolution propagandists. Both Bill Nye and Ken Ham managed to get people thinking and asking questions. Expositions, emphasizing the typology of Christ from the ark. "A type is not a metaphor. It is something that is real, but that also has spiritual significance." Ancient history of the immediate post-Flood time and how old earth compromises entered more recent theology. Science is next, "For some, the scientific information is what makes the subject interesting. For others, being blinded with technicalities is undesirable, so it should be possible for such people to skip or skim through this section", but he simplifies it where possible. A fiction section, short first-person accounts of living at the time. A gospel presentation showing how the ark is a type of Christ. Taylor discusses different Flood models by creationists, especially in the geology areas. He emphasizes more than once that the people who propose their scientific models know that the Bible is inspired, not their models. Theories and models change, but this does not threaten their faith in Scripture itself. There was one area that I did not appreciate: Radiometric dating in Chapter 13. "I need to underline this point: radiometric dating is NOT inaccurate." Keep reading. I would phrase it as a "yes, but" item. Paul stresses that radiometric dating is extremely accurate, and highly-trained scientists make their livings performing it. However, those results of billions of years are based on fundamentally flawed assumptions. 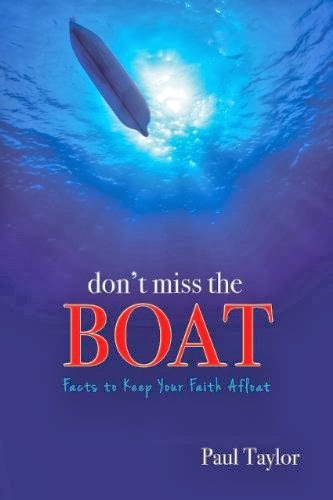 Don't Miss the Boat will give the honest inquirer a great deal of useful information as well as reference material for further research. It shows how the Scripture clearly teaches that the Flood was global, and is scientifically feasible — once someone drops the evolutionary presuppositions and biases. Taylor also shows how the ark was not only possible, but reasonable. Do I agree with everything he says? No. Do I disagree over items that matter? No, again. Would Bill Nye made so many blunders in the debate if he had read it? Probably, but he would not have had any excuses. Do I recommend the book? Yes! It is available in paperback and e-book formats. There is also a DVD to go with it that I have not yet seen. As I am writing this, the book and DVD set are on sale. Did I get compensation for reviewing the book or mentioning the sale? Nope. Creationist from Ignorance of Evolution?